I am still on my quest to create fun and exciting squash and zucchini recipes! My zucchini is almost done I think, but my squash has taken over where the zucchini has left off. 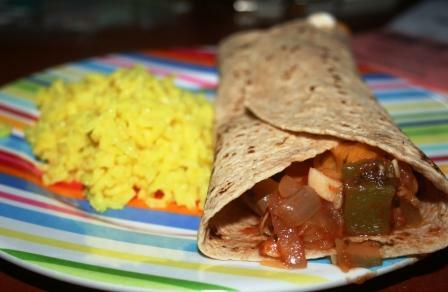 I made burritos the other day from a mixture of squash and zucchini, and they turned out wonderfully. Combine all ingredients in a large pot. Bring to a good simmer, reduce heat, cover, and simmer for 40 minutes or until tender. Remove bay leaf, and use a slotted spoon (it will produce some liquid in cooking) to drain and spread on tortillas. Top with sour cream and cheddar cheese if desired. Serves 6. Sounds delicious to me. I'll have to make these for my husband soon. You guys have a great weekend! Oh yum! These look really great. I didn't plant any zucchini or squash this year. Next year when I expand the garden, I am going to include them. That, and cucumber! Looks good. You are so creative in so many ways! This looks yummy. I bet my meat loving husband would love it too. Oh my gosh, I need to make this. I used to be a vegetarian and was just telling my husband yesterday that I want to start cooking that way for the kids at least once a week. I will have to try this first. And no dairy? I love you for this! Yummy yummy yummy!! Looks DELICIOUS :) I'm going to have to try that one day this week for sure! Thanks for the fab recipe!! I have never cooked anything with squash i think.... maybe this is a good time to start???? Looks really yummy and what a great way to use up those veggies!